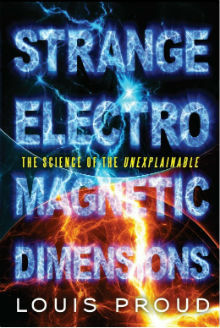 This fascinating book skates precariously around the edge of our scientific understanding of electromagnetic fields, and their alleged effects upon the world and its human inhabitants. Perhaps its main focus is an enquiry into whether electric shocks and lightning strikes can go on to subtly change physiological characteristics in affected people, creating in them psychic and/or PK abilities, as well as a propensity to be further affected by electric shocks in the future. This enquiry is broad in its scope, and necessarily provides comprehensive reviews of our scientific understanding of electromagnetism (EM), lightning, alleged allergic reactions to EM fields, magnetoreception (the biological capacity to respond to environmental magnetic fields) and a great deal else besides. It's a tall order, but Louis Proud's writing is clear, instructive and generally well focussed. He draws together a great deal of material - much of it unexpected, yet highly relevant. The book begins with an examination of whether humans are able to respond subconsciously to fluctuating magnetic fields. It's clear that such an ability is present in nature, providing the capability for birds to migrate successfully, for example. The mechanism for providing this 'magnetoreception' capability is barely understood, it seems, as it's proven difficult to determine what the magnetically sensitive cells are, and where in the body they are to be found. In the last few years, various studies on rainbow trout, cows, deer, turtles and mice have moved things along significantly, and led to speculation that humans may retain the vestiges of magnetoreception from the hunter-gatherer days (p33). However, such leaps in our understanding regarding human magnetoreception are generally challenged by scientists, who argue that such sensitivities would be very weak and subject to any number of disruptive environmental influences. Nonetheless, this possibility leads on to the potential for humans to be sensitive in various ways to other electromagnetic fields, particularly in terms of harm to health when chronically exposed to powerful fields, as many people (including the author) claim to have experienced. However, there's evidently no blanket effect upon all people exposed to such EM or RF fields; the science is going to rest upon the appearance of statistical aberrations indicating a higher prevalence of health problems associated with smart meters and power lines, rather than just the anecdotal case studies, no matter how convincing they might appear. Where Louis Proud might have a point is when he discusses individual human sensitivities to these fields. The fact that science might be able to demonstrate that some people show no sensitivity to EM/RF fields in experiments, does not indicate that it follows that all humans lack such sensitivities. Which brings us to allergic reactions, and the possibility that an EM field might act as an allergen. The author argues in some cases, EM fields can disturb immune function through the stimulation of various allergic inflammatory responses (p114). Many people unfortunately suffer from multiple allergies, and it has been proposed that the immune system chains these factors together by association while a reaction to a primary allergen occurs. Might EM fields of certain frequencies be included in this cascade effect? An extreme form of EM exposure occurs with lightning strikes. The author provides superb descriptions of how lightning is thought to work, our medical understanding of the effects that result upon the body, and why it is that some of the resultant symptoms and long-term health problems are delayed before becoming apparent. He looks at the phenomenon of multiple lightning strikes, and whether there might be an underlying scientific explanation for why these occurs. Science seems to side with non-causal statistical blips (p178), but that seems hard to justify when looking at cases where people have been struck by lightning up to seven times. The odds against seem cosmic. It's also curious that there is no record of a fatality upon the second or subsequent lightning strike (pp160-1). Do the sufferers somehow build resistance and/or attractive properties to lightning? In some cases, the effect of the lightning strike is life-changing. The author argues that there can be an 'awakening', commensurate with the acquisition of psychic abilities (p172). Lightning strikes are associated with the flowering of shamanic powers in some traditions, perhaps with good reason. Some scientists are more open to such possibilities than others, and the author discusses the work of Oxford academic Michael Shallis regarding 'electric people' (p192). The phenomenology of psychic and Psycho-Kinetic (PK) effects associated with historic lightning/electric shock exposure (p198) seems to hinge upon the build up of stress acting as a kind of catalyst (pp201-3). Is there a build up of static charge around the affected individual at times of stress that is then directed in ways that currently defy our understanding? These are very good questions, I think. The author then moves into a broad discussion of psychic and PK studies, and how they might be associated with non-ionising EM radiation. This culminates with various theories put forward linking psychic and PK abilities, EM fields associated with allergic reactions and how 'electric people' may be allergic to certain EM/RF frequencies. These connections appear plausible and worthy of study, although I daresay most scientists would put this type of enquiry into the 'Here be Dragons' box. The book then winds down with some classic Ufology and an examination of whether some paranormal phenomena (like the Foo Fighters widely seen by airmen during World War II) might be connected with ball lightning, Earth lights and the like (p254). I very much enjoyed this book, and shared many of the quirky facts within it with my kids. I would say that it suffers with what I'd call 'TLA Syndrome': The quantity of Three Letter Abbreviations got out of control, and I found myself having to dig back through the book to remind myself what they stood for. The book could do with a glossary. But other than that, it was well written and researched, and very thought-provoking. From a purely scientific perspective, I feel that his thesis likely falls short of being compelling - the evidence he provides builds mostly from anecdote and case studies - but his argument is well made nonetheless, and should be seriously considered. I was left with the distinct impression that there is something to all this that science is unreasonably ignoring, and that a broad scientific examination of the available evidence is overdue. If correct, this line of reasoning might some day lead to major breakthroughs in the scientific recognition and understanding of many paranormal phenomena. Subtitled "The Science of the Unexplainable"